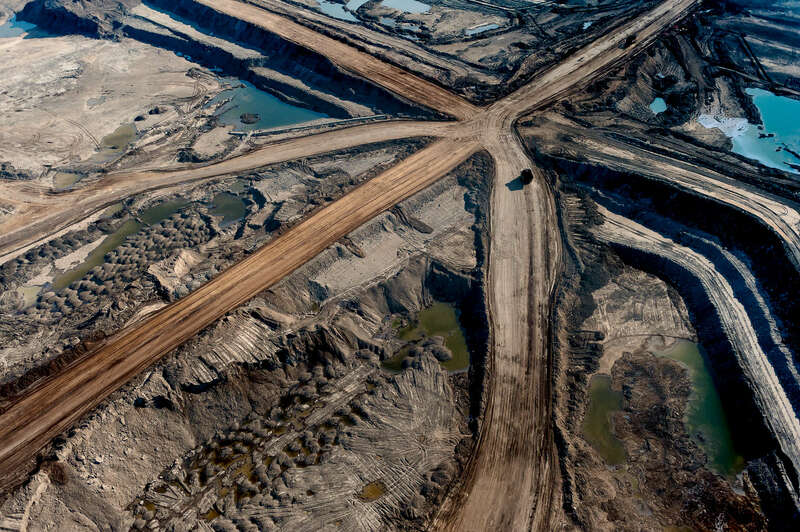 Industrial landscape: Canada's Tar Sands: Tar Mine and Roads. Tar Mine and Roads. Northern Alberta. Canada. 2010. Trucks the size of a house look like tiny toys as they rumble along massive roads 80 meters above a mine. The scale of the Tar Sands is truly unfathomable. To date, 4,500 square kilometers have been directly impacted by the mines. Alberta Energy has reported that the landscape being industrialized by rapid Tar Sands development could easily accommodate one Florida, two New Brunswicks, four Vancouvers, and four Vancouver Islands. Nikon D3, Nikkor 24-70 f2.8. Shot at 35mm, iso 800, 1/1600 at f4. Alberta Tar Sands, Northern Alberta, Canada.